Planting InstructionsSet at the same level it is growing in the grower's pot. Firm and water in thoroughly. Winter CareMulch the first winter to prevent frost heave of young plants. Remove very early in spring, before growth starts. 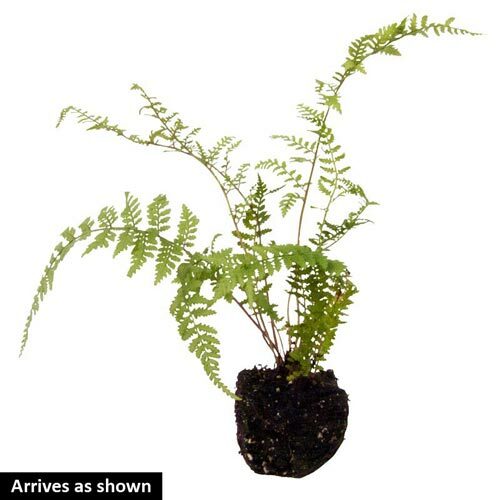 Foliage TypeGently arching narrow fronds with beadlike petite lobes. Said to resemble tatting (handmade lace). Overall silver-gray foliage color. Soil RequirementWell drained, moisture retentive, humus enriched soil. Watering RequirementKeep envenly moist. Drought can force plants into dormancy. 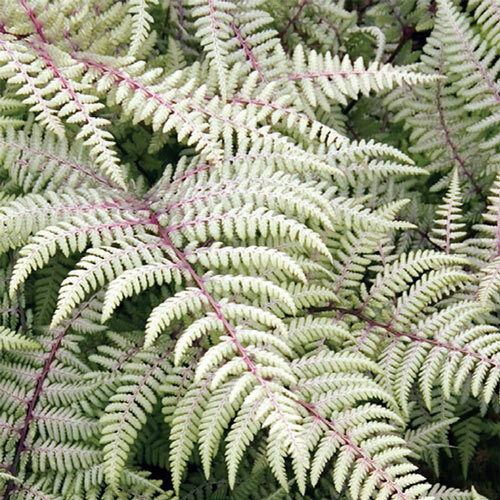 Unique CharactersticsA hybrid cross between Japanese Painted fern (A. niponicum 'Pictum') and Lady Fern (A. filix-femina), this selection sports stunning frosted apple green fronds that seem to emit a ghostly white light in the shade. Dark purple stems hold the broad fronds rigidly upright. This selection is taller than many other Athyriums and is more tolerant of dry soil.